Section I. Biology of Basement Membranes. Early Years of Basement Membrane Research. Morphology and Ultrastructutre of Basement Membranes. Functions of Basement Membranes. Section II. Chemistry and Metabolism of Basement Membranes. Structural Macromolecules: Type IV Collagen. Minor Proteins of Basement Membranes. Minor Collagens of the basement Membrane Zone. Biosynthesis of Basement Membrane Macromolecules. Internal Organization of Basement Membranes. Contacts of Basement Membrane Molecules with Cell Membranes. Section III. Alterations of Basement Membranes in Pathologic and Physiologic States. Immune-Mediated Diseases Involving Basement Membranes. Genetically Mediated and Acquired Basement Membrane Disorders. Biological Properties of Peptides Arising from Type IV Collagen and other Basement Membrane Proteins. 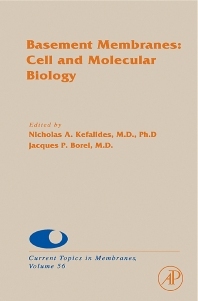 Basement Membranes: Cell and Molecular Biology brings together the most important research developments of the past 45 years that have enriched our knowledge and contributed to a better understanding of the biochemistry and cell and molecular biology of basement membranes. It describes the studies that shed light on the ultrastructural organization, the biosynthesis of the macromolecular components, their functions in embryonic development and differentiation, and in the mature state. A major portion of the book is devoted to the description of the genes that regulate the expression of the various structural macromolecules. Researchers in cell biology, developmental biology, biochemistry, bioengineering, genetics, immunology, immunochemistry, neuroscience, diabetes, nephrology, embyrology, vascular surgery, cardiology, rheumatology, hematology, bone and joint surgery, cancer research, and angiogenesis. Professor of Medicine-Emeritus, Professor of Biochemistry and Biophysics, University of Pennsylvania School of Medicine, Philadelphia, PA, U.S.A.